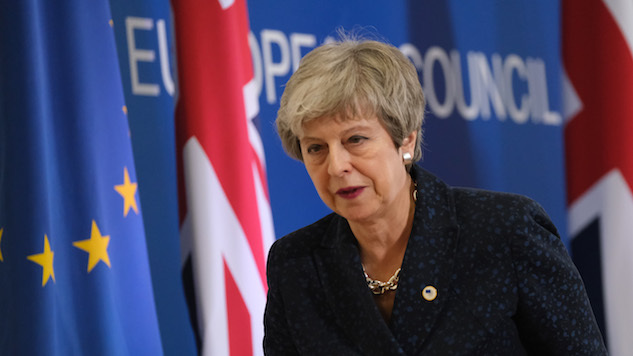 European Union leaders have agreed to push back the looming deadline on Brexit provided the U.K.’s House of Commons can pass Theresa May’s withdrawal plan this week, the European Council announced on Thursday. The delay would have the U.K. leave the E.U. on May 22 instead of the previously agreed-upon March 29 deadline. If the House of Commons fails to pass the Withdrawal Agreement this week, the deadline will only be pushed back to April 12. Despite the cliff’s edge being moved away a few weeks, a no-deal Brexit is still a very real possibility. May is now forced to pass a plan for withdrawal that has been struck down by Parliament not once but twice now. Failure to do so this week could send the U.K. careening towards a hard exit from the E.U. on April 12 with no infrastructure in place to deal with the fallout, resulting in serious economic damage to both the U.K. and the E.U. If Parliament fails to pass a plan by April 12, a longer extension would require the U.K. to participate in elections for European Parliament in May, despite voting to leave the bloc nearly three years ago. May’s current plan, which is somehow unpopular with both the Remain camp and the hard-line Brexiteers, would have the U.K. slowly take control of immigration from Europe, but would keep the country in the E.U.’s trade and customs agreements until at least the end of 2020. Parliament could also vote to keep closer ties with the E.U. in a so-called “soft Brexit” if the current plan fails, and May did not rule this option out when speaking to press after Thursday’s decision. However, she also did not rule out a no-deal Brexit, instead blaming lawmakers for the political stalemate at which the U.K. has arrived. The House of Commons is scheduled to hold a debate on the withdrawal plan on Monday to follow up Parliament’s vote to reject it last week. The new, more meaningful vote is set to take place later in the week.